If you answered yes to some of these, it might be your thyroid. Specifically, it may be your Free T3. We’ve all heard about hypothyroidism. Usually, it’s in reference to how someone has a “slow metabolism.” Yes, the thyroid hormones control the speed at which processes happen in the body or your metabolism. You can also have the opposite problem of too much thyroid hormone:hyperthyroidism. If your thyroid hormones are out of whack it can affect your energy levels, mood, athletic performance, and body composition, in addition to many other things. There are actually many thyroid hormones and the way they interact is quite complicated. But, today I want to talk to you about the most important thyroid hormone: Free T3. (That’s it, there to the right) Free T3 is the workhorse of all the thyroid hormones. Let me explain how thyroid hormones are produced and work, so you can understand why Free T3 is the stud of the thyroid family. First, our hypothalamus is responsible for sensing the levels of thyroid hormones in the body and releasing thyrotropin releasing hormone (TRH). TRH stimulates the pituitary gland to produce thryoid stimulating hormone (TSH), which stimulates the thyroid gland to produce T4 (thyroxine) and T3 (triodothyronine). T4 is produced in much greater quantity than T3. The ratio is about 17:1. T4 is basically a precursor to T3. Your body must then convert T4 to T3. This conversion happens in several organs and tissues in the body. Now, you might be wondering what is this “free” T3 business all about. The term “free” is used to represent the amount of T3 that is not bound by things called globulins, which are proteins that carry the thyroid hormones to tissues in the body where they can exert their actions. When T3 is bound up by these globulins the T3 is not available to be used by the body. Essentially, the bound T3 is useless until it is unbound from the carrier protein. For most people, this unbinding does not present a problem. However, should your body not convert enough T4 to T3 or should too much of your T3 become bound by the globulins you probably will end up feeling the effects of low thyroid function, or hypothyroidism. If your body doesn’t bind enough T3 you will experience symptoms of hyperthyroidism, which can be just as frustrating. Without adequate Free T3 levels, a person may feel fatigued, have mood problems like depression or anxiety, be inappropriately cold, have dry, brittle hair and dry skin, struggle with losing weight, and/or have high cholesterol. The opposite is true of too much T3. Heart palpitations, an inability to gain weight, anxiety, muscle weakness, and insomnia are all symptoms associated with hyperthyroidism. None of that sounds good, so it would be of benefit if you are having any of these symptoms to see your healthcare provider and ask that they check your thyroid levels including a Free T3 levels. Now is when you tell me, “I’ve had my TSH checked many times and my doctor says it’s just fine.” Yes, TSH is the standard measuring stick, if you will, for how well your thyroid is functioning. Normal levels of TSH are between 0.4 and 4.0-4.5 mIU/L. But, many times TSH is misleading if one does not consider that Free T3 can be low even with a completely normal TSH levels. TSH is produced only when the body senses that not enough thyroid hormone is being produced. If your body is making plenty of T4 and even T3, but that is not translating to enough unbound Free T3, TSH levels are meaningless. Free T3 levels should be between 2.0-4.4 pg/ml. This may vary depending on the lab used to evaluate blood levels. The moral of the story is that if you are experiencing any of the many symptoms normally tied to thyroid function then get it checked out. Even if the test results come back as “fine,” make sure that TSH isn’t the only thing being checked. Free T3 is so important in this equation. Another consideration often overlooked in the world of hormones is that the “normal” ranges are not always representative of where you may feel and look your best. Find a practitioner who is willing to listen to you and pay attention to your symptoms, rather than the lab numbers. This is your athletic performance, your well being, and your overall health we’re talking about. Vanessa Benning ton, NP found her way in the health and fitness worlds through a unique combination of education, personal experience, and self-experimentation. During high school, she dropped from a weight of around 140lbs on her 5’4″frame, to barely 90lbs. Vanessa eventually stumbled from fat-free diets and endless cardio to a more traditional “bodybuilding” diet and training plan. Things started to improve. She fell in love with working out and exercising, but was weak, fatigued, depressed, anxious, and still unhappy with her body composition, despite trying everything she thought was correct. This pushed her to seek more knowledge and her first piece of traditional education was a Bachelor of Science in Exercise Science. As much as she enjoyed the idea of spending her days in the gym and training people as a career, she was concerned her small town in Louisiana would never provide enough clientele to support full time training. Vanessa completed a Bachelor of Science in Nursing and continued through to earn a Masters in Nursing as a Family Nurse Practitioner. Vanessa does individualized nutrition and training programs and may be contacted at azleav@gmail.com. You can also follow her and her husband on their blog, Perfect Couplet and on Facebook. This article originally featured in BreakingMuscle.com. Questions or anything to ask Vanessa about testing your Free T3? We want your thoughts in the comments section–Please! How do you know how much to take? 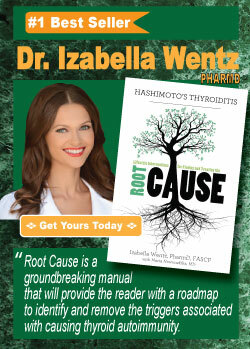 If your Free T3 is high, should you back off thyroid meds? My Free T3 has increased last two blood draws and is now 5.0. Dr wants to back off Armour. I have been having anxiety and insomnia but I was in a MVA almost 4 months ago and have been dealing with PTSD and pain. Therapist thinks it is just stress from anxiety. I am not having any heart racing or palpitations. Acupuncture has decreased anxiety some but I just want to be sure I am not starting to go hyper. My Free T3 is 3.3, but my T4 is 4.2 and Free T4 is .76, TSH .96 (down from 67). Can’t sleep more than 5-6 hours per night, have lost over 15 pounds, just can’t put the weight on. Also Hashi TPO at 156 (down from 280). On Nature, 65mg. Would just like to get 8 hours of sleep and put on some weight. Suggestions?